This paper presents a model for determining the static load on movable spatial console lattice girder and the clamps which bounded the same one. The paper presents guidelines for theoretical determination of the static load using an appropriate software package and conducted modeling for this purpose. Also, the paper displays the methodology for experimental determining the static load by setting a model for the experimental measurement on the specific measuring points of the clams and the characteristic positions of the carrying console. The research is carried out on a concrete real object and the results are shown numerically and graphically, which enables carrying out an analysis of the load and deducing concreting conclusions about the research object. The main task of the research is to establish the regularities of the formation of a non-detachable compound of thin-walled elements from the Ni-20Cr-6Al-1Ti-1Y2O3 alloy and to determine the functional condition of the influence of soldering modes on the physical-mechanical characteristics of the compound. It has been shown the modeling of temperature fields in ANSYS 18.1. It has been established that the process of vacuum soldering should take place at a temperature of 1350°C for 15-20 min; the strength of the resulting compound is 390-420 MPa when the sample is stretched. The obtained information can be used as a theoretical basis for the development of the manufacturing process of the elements of the spaceship heat-shielding system. High-frequency electric resistance welding (HFERW) is one of the most common process for production of longitudinal welded carbon steel pipes, suitable for line pipes, casing, and tubing. In the edges joining line of hot rolled coils is formed decarburization layer which sometimes appeared negative impact on the microstructure and mechanical properties of the welded joint, so the aim of this paper is to investigate impact of this layer on the crack propagation in the pipes welded joint, obtained by high frequency electric resistance welding (HFERW). Crack propagation in the pipes welded joint monitored by macro and microscopic analysis as well as by the hardness testing, along and transverse through decarburization layer. Results of this investigation brings additional knowledge about impact of the decarburization layer on the crack propagation in the high frequency electric resistance welded joint. 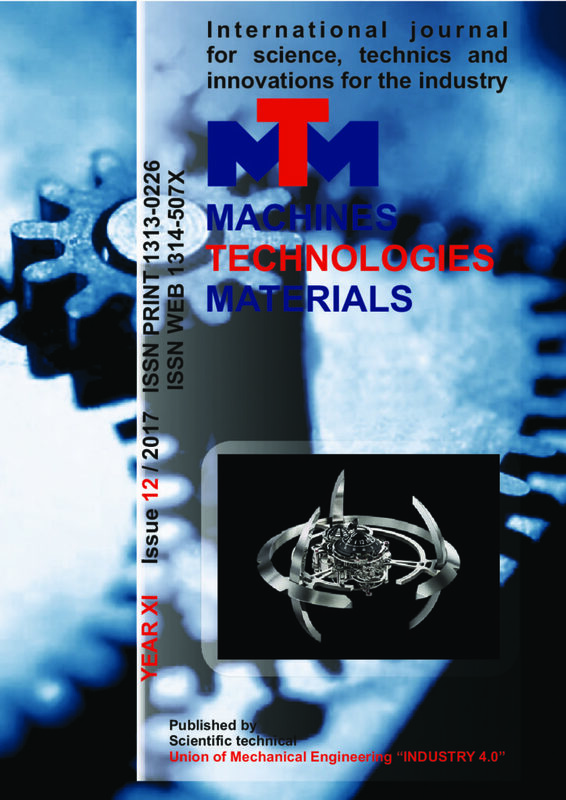 In the paper are presented the main theoretical techniques used for the modeling and simulation of industrial processes. The main focus is on the physical side of the theoretical techniques and their mathematical side is reduced to a reasonable minimum. Different theoretical approximations as thermodynamic and hydrodynamic levels are used. In coding theory, a linear code is an error-correcting code for which any linear combination of codewords is also a codeword. Linear codes are traditionally divided into block codes and convolutional codes. Linear codes allow more efficient encoding and decoding algorithms than other codes using the syndrome decoding. Linear codes are applied in methods for transmitting symbols on a communication channel so that, if errors occur in the communications, some errors can be corrected or detected by the recipient of a message block. The codewords in a linear block code are blocks of symbols that are encoded using more symbols than the original value to be sent. A (6, 3) linear block code example and its decoder implementation using Logisim, an educational tool for designing and simulating digital logic circuits, are given in the paper. The processes of encoding and decoding when detecting and correcting errors using this (6, 3) linear block code are illustrated. The material presented in the paper is used in the educational process in the University of Ruse. In this paper we try to build a framework in optimization model building for students without previous mathematical optimization training and experience. While modeling is a matter of art, approach and compromise between complexity and closeness to reality we need to spend some time on the basics of optimization modeling such as cost function, constraints, variables and coefficients. There is a huge variety of optimization problems solved in Electric Power Systems. The most complex of all is considered to be the Unit Commitment problem where at each iteration an Economic Dispatch is performed. Electron beam (EB) irradiation has the ability to modify polymer substrates by process of graft copolymerization to synthesize water-soluble copolymers having flocculating potential. Models – depicting the dependencies of the described quality characteristics (their means and variances) from process parameters – are estimated by implementation of the robust engineering methodology for quality improvement. Multiple criteria optimization based on the desirability function approach, involving requirements for economic efficiency, assurance of low toxicity, high copolymer efficiency in flocculation process, good solubility in water, bias, robustness, quality of prediction and the relative importance of responses, is presented. Air pollution problems in urban areas mainly can be connected with the high amounts of toxic exhaust emissions, generated from the growing use of vehicles that use fossil fuels. Roads in urban areas are full with vehicles, and their management is important not just for smoothing traffic flows, but also for reduction of air pollution. Various ways could be considered in which traffic management can affect local air pollution. But, is not just traffic management that should be considered solely. Attention should be given to the behavior of the drivers, which also has his impact on air pollution levels. Therefore, the purpose of this paper is to show the importance that traffic control and management as well as drivers’ behavior together have on exhaust emission pollution. In addition to that, measures with their effects in the both categories: traffic management and drivers’ behavior are proposed. In order to establish this model, several independent variables of aggregate level and dependent variables have been taken into account for traffic production of a region for a period of 24 hours. The objective of this paper is to identify and estimate the main variables which are significant for development of a suitable model for forecasting the traffic production for Anamorava region. Establishment and assessment of a model will be done using techniques such as Multiple Regression Analysis (MRA) and Radial Basis Function Neural Network (RBFNN). The results gained according to these two techniques will be compared to find out differences. In this regard performance analysis through indicators R2, ME, RSME which are also used to show errors in forecasting. The results are in favour of RBFNN model because it performs better than MRA in forecasting traffic production.